Get your commercial landscape ready for the new season! Is your commercial landscape ready to impress? With the last signs of winter quickly fading it’s time to clean up your commercial landscape for spring. If you want to inspire with your image and lure in new customers, it’s time to make your plan for spring. 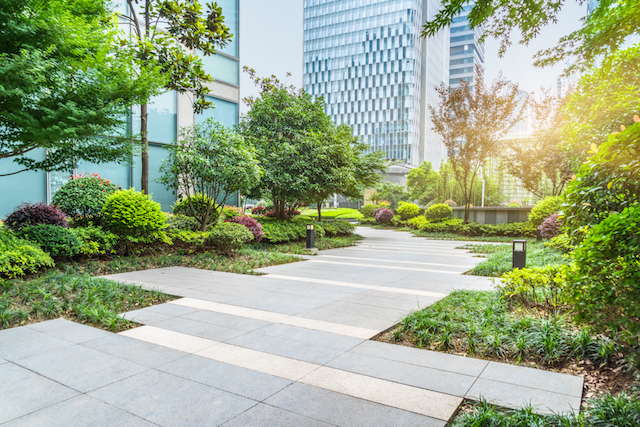 To get you started, here are four tips on how to begin planning your commercial landscape. It’s likely that winter conditions left you with plenty of work to do, from damaged plants to broken pavement. The first step you need to take when getting your property ready for spring is to do a thorough walkthrough of your entire grounds to ensure everything is in safe, working condition. Not only can you check for any damage, like holes and debris, but you can begin to see if there are any new elements to add, like additional plants or fencing. After the harsh winds of winter, it’s more than likely your commercial property needs a thorough cleaning. Broken branches, leaves, and twigs will need to be cleared away. This is also the perfect time to clean any walkways, walls and the exterior of your buildings to ensure a consistently well-kept image. If you’ve found a few dead spots throughout your properties lawn you’ll want to take this opportunity to aerate the soil and lay down new sod or seed. Follow up with fertilizer and a pest control plan to ensure your grass stays healthy throughout the season. To ensure your landscaping lines are clean and your plants stay healthy, finish up with a fresh layer of mulch. The deep color of new mulch in contrast to the green of the grass is something few can resist. From putting together a spring plan to updating your properties landscape, Atlantic Maintenance Group has you covered. If you are looking for help keeping your residential or commercial property free from soil erosion or other lawn diseases, Atlantic Maintenance Group is ready to help you with our variety of landscaping, asphalt, snow removal, and concrete maintenance services. We are experts in our field, and we are prepared to meet your needs with a price and product that will leave you grinning. If you’re interested in getting a free quote or more information, visit us online or give us a call at (410) 768-4720. To see examples of our work and stay up to date on our specials, follow us on Facebook, Twitter, Pinterest, and Google+. This entry was posted on Friday, April 13th, 2018	at 6:06 pm	and is filed under Landscaping Maintenance	. You can follow any responses to this entry through the RSS 2.0	feed. Both comments and pings are currently closed.